Bharatiya Janata Party President L.K. Advani today demanded that those named in KGB revelations should either sue the author and the publisher for defamation or they must face action. It is 6.30 am. A large gathering of supporters have already reached the ancestral house of Chief Minister Bhupinder Singh Hooda in Adarsh Colony on the Delhi road here. Dream of a residential plot in the much publicised ‘Garden Villa’ sectors of the Haryana Urban Development Authority in the Aravalli hills here has been shattered for the applicants, who had deposited the booking amount two years ago. The Indian National Lok Dal has condemned the Haryana Government for failing to raise the SYL issue with the Prime Minister, Dr Manmohan Singh, during his recent two-day visit to Chandigarh. The Punjab and Haryana High Court today imposed a fine of Rs 2,000 each on a former Deputy Commissioner, Kaithal, Mr Anurag Aggarwal, and a former Block Development and Panchayat Officer, Mr Chand Ram Guhla. Family members of Kanshi Ram raised slogans against Bahujan Samaj Party President Mayawati and subsequently burnt her effigy in Ambala Cantt today. While the accused in the murders at Suneri Khalsa village, Ram Kishan, was remanded in judicial custody by a city court here today, the exact reason which made him clobber his wife and four children to death on Saturday night was not known, as he reportedly remained mum most of the time since yesterday. The driver of Mr Kulbir Beniwal, Congress MLA from the Bhattu constituency, allegedly attacked a junior engineer and some other officials of the Haryana Public Health Department while they were on a drive to disconnect unauthorised water connections at Chuli Bagrian village on Saturday. In a bizarre incident, a man of Narukheri village killed his wife by throwing her into canal in front of her mother last night. He reportedly did so in order to take `revenge’ from her as he had to remain in jail for some time on her complaint some time back. Lieut-Gen S. Pattabhiraman, GOC-in-C and Vice-Chief of Army Staff designate, paid a farewell visit to Kharga Corps today. General Pattabhiraman was accompanied by Mrs Laxmi Raman, president, Western Command Army Wives Welfare Association. Bharatiya Janata Party (BJP) President L.K. Advani today demanded that those named in KGB revelations should either sue the author and the publisher for defamation or they must face action. Mr Advani, who was addressing an election rally in support of BJP candidate Capt Abhimanyu in the Rohtak Lok Sabha byelection here on the concluding day of the campaigning said KGB revelations had only confirmed what had been suspected since long? Those named in the book should feel ashamed, he added. The senior BJP leader said he was not worried much by the allegations against the Congress and the Communists. It is widely known that the Congress has been a party of the corrupt and the Communists had betrayed the country even during the Chinese aggression on India. His worry was the assertion made by the author that in the early seventies India seemed to be on sale? He said, to him, as President of the BJP this assertion was not only a personal insult but also as the national insult. 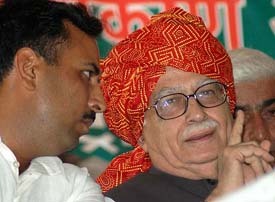 Mr Advani accused the Congress-led UPA Government of having failed in ensuring internal security of the country. The UPA government had failed miserably to tackle Naxalite movement as well as terrorism. Appealing to the voters of Rohtak to support the BJP nominee, Mr Advani said the people of the state had never tolerated family rule. That is why the previous government in Haryana was voted out, he added. He said by fielding the son of Chief Minister Bhupinder Singh Hooda, in the Rohtak parliamentary byelection, the Congress had only promoted the parivarvaad, which would not go down well with the people. It is after a long time that the BJP has been able to organise such a rally in the State. One can say that today’s rally further diminished prospects of the Indian National Lok Dal of Mr Om Prakash Chautala in the Rohtak byelection. The party is fighting to save its prestige in the area which once used to be its pocket borough. Speaker after BJP speaker attacked the Congress, virtually ignoring the INLD as if the party was of no consequence. They projected the byelection as means to keep check on the inefficient Hooda Government in Haryana. Having a dig at the UPA government, former BJP President, Venkaiah Naidu, said under the Manmohan Singh government right hand proposes, the left opposes, while the mind disposes?. The Government was moving one step forward and three steps backward. BJP MP from Amritsar and former cricketer, Navjot Singh Sidhu regaled the audience in his own style. President of the Haryana BJP Ganeshi Lal, alleged that the Hooda Government was dividing the classes and communities by engineering incidents like that of Gurgaon and Gohana. Senior Haryana BJP leader Ram Bilas Sharma — a former party chief, Mr Rattan Lal Kataria; two MLAs, Ram Kumar Gautam and Naresh Malik; former Union Minister of State, I.D. Swami; and former Delhi Chief Minister, Mr Sahib Ram Verma were among the speakers. It is 6.30 am. A large gathering of supporters have already reached the ancestral house of Chief Minister Bhupinder Singh Hooda in Adarsh Colony on the Delhi road here. They have come to express their solidarity with the Hoodas, whose youngest generation, represented by Deepender Singh, the only son of Mr Hooda, is making his appearance on the political horizon of Haryana by the ensuing Rohtak parliamentary byelection. While many wait in verandah to see a family member, others are privileged enough to be seated in the drawing room. So are the members of the Press. A beaming Asha, mother of Deepender, welcomes newsmen. She informs them that her husband has gone for his morning walk in “Double Park” in Model Town, while the candidate is getting ready for the day, which, being the concluding day of the campaigning, is going to be extra hectic. She asks her driver to take the waiting newsmen to Mr Bhupinder Hooda, meanwhile. There is no one in the park, which is a mute witness to the heavy rain which lashed the town two days ago as well as the perennial drainage problem of Rohtak, the political capital of Haryana. Newsmen look for the Chief Minister. A group of persons is walking outside the park. The newsmen approach them to inquire about Mr Hooda. One of them is Mr Hooda himself, without any security or other paraphernalia usually associated with a VVIP. The newsmen join him. But he casually stops at a newly-built house. The visit was unexpected. The owner takes time to come out. He turns out to be a former Haryana minister, Mr Subash Batra, who had once deserted Mr Hooda to join hands with Mr Bhajan Lal. Short while after, the newsmen return to the Hooda house. They are ushered into a bedroom where foreign-returned Deepender is partaking typical north Indian breakfast, “paranthas and dahi (curd)”. He tells newsmen about a village which he visited a couple of days ago. He proudly tells that in that village everyone addressed him as “Choudhry Ranbir Singh’s pota (grandson)” and not as Mr Bhupinder Hooda’s son. After a quick grub, he is ready to move out. But first, he must go to the room of his grandparent, with whom he is greatly attached. The grandpa is in the bathroom. The grandmother, Mrs Hardai Devi, pats his head and remarks: “Beta maara ho gaya se, haand haand ke (son you have gone weak because of lot of travelling). Deepender puts her concerns at rest by telling her that “mota ho gaya hoon doodh pee pee ke (I have put on weight as I have to take lot of milk at supporters’ houses these days). Before he sits in the sports utility vehicle (SUV), he meets each and every supporter of his waiting for him since early morning, besides giving a short interview to an electronic channel. BHALOT: 8.30 a.m. A large crowd has gathered in the village chaupal to hear what Deepender has to say. He is loaded with several “pagrees (turbans)”, a token of honour, and other gifts, including silver crowns, golden rings bearing the Congress election symbol, a portrait of his and a “booka (bouquet)”. While he retains the gift, a garland of currency notes is returned. Deepender is accompanied by a handsome bespectacled young man. Everyone is curious about his identity. Soon the stage secretary solves the mystery. But perhaps he is also not aware of his name. Therefore, he addressed the young man as “Venod Sharma ke ladke ji”. Lo, he is Manu, elder son of the Haryana Excise and Taxation Minister, Mr Venod Sharma. Dream of a residential plot in the much publicised ‘Garden Villa’ sectors of the Haryana Urban Development Authority (HUDA) in the Aravalli hills here has been shattered for the applicants, who had deposited the booking amount two years ago. The HUDA office has announced to wind up the scheme for which initial amount of Rs 5 lakh was collected from 62 applicants for huge sized 52 plots. The scheme of ‘Garden Villa’ plots was launched for the first time in Haryana in August 2003, when the department announced to carve out two special sectors of 44 and 47 in the midst of green Aravalli hills on the Surajkund road here and asked each applicant to deposit at least Rs 5 lakh as booking amount as the size of each of the plot was 2000 sq mtr and the rate per sq. metre was fixed around Rs 2500. Though the number of applicants for these plots was just 62, the scheme was kept open for applications for three months. Though the department now officially announced to abandon the scheme, a majority of the applicants had not been told about this move by the HUDA, said an applicant based in Gurgaon. He said the reported decision of the HUDA had been shocking and was like betraying the applicants, who had been awaiting draw of lots for two years. Confirming this decision, HUDA Administrator Sudhir Rajpal said that the scheme had been given up mainly due to the controversy regarding the Forest Department claiming that the land belonged to it and the notice given by the department to it. Stating that all 62 applicants would be returned their booking amount with interest very soon, he said there was alternative scheme for such applicants at present. HUDA has developed a park named as ‘Leisure Valley’ park in the area, which was to be surrounded by Sectors 44 and 47 from two sides. The department has spent Rs 2 crore on development of this park and it was inaugurated by then Chief Minister O.P. Chautala, last year. The state Forest Department issued notices to several builders and government department for allegedly violating the norms under which no construction could be done in the forest land without prior permission. A PIL has been pending in the Supreme Court in this regard. But on other hand the majority of the applicants seem unwilling to buy this theory of the HUDA and have announced to take it to the court on the issue. According to Mr B.R. Sachdeva, President of the Garden Villa Plots Applicants Association, announcement by the HUDA to wind up the scheme was not only shocking but unjustified and the members would not accept this decision. He announced to take the matter to court to get justice. Claiming that the area which had been served notices had still been witnessing widespread construction activity both by the government and private agencies and there had not been any stay on construction in the area so far. He said even the Haryana Tourism and the HUDA was already having large properties in the area and there was no justification in the move. The Indian National Lok Dal (INLD) has condemned the Haryana Government for failing to raise the SYL issue with the Prime Minister, Dr Manmohan Singh, during his recent two-day visit to Chandigarh. Mr Ajay Singh Chautala, member of the Rajya Sabha and secretary-general of the INLD, said in a press release here today that the issue of the SYL canal, the lifeline of Haryana, was not touched by the Prime Minister. Nor did the Chief Minister, Mr Bhupinder Singh Hooda, deem it fit to raise the subject. This was a pointer to the Congress party’s tactics of delaying the implementation of the Supreme Court verdict on the completion of the canal. Mr Chautala said even when the Congress President, Mrs Sonia Gandhi, visited Jind to address a public rally, she failed to address the issue of the SYL canal. The Congress leaders of the state did not raise the issue with their party president, the INLD leader alleged. The Punjab and Haryana High Court today imposed a fine of Rs 2,000 each on a former Deputy Commissioner, Kaithal, Mr Anurag Aggarwal, and a former Block Development and Panchayat Officer (BDPO), Mr Chand Ram Guhla. Some days ago, Mr Justice M.M. Kumar had found both prima facie guilty of committing contempt of court. The court had issued notice to them to afford them the opportunity of hearing on the quantum of sentence. Today, the officers tendered their apologies through an affidavit, which was taken on record. Thereafter, Mr Justice Kumar directed them to pay the fine amount to the petitioner. The order was passed on the petition filed by Mr Shamsher Singh, resident of Ferozepur village in Kaithal, seeking action against the two officers under the contempt laws. As per the case, following a complaint lodged by the petitioner, the then Sarpanch of Gram Panchayat, Ferozepur, Kaithal, was suspended for allegedly misappropriating public money. A preliminary enquiry found her prima facie guilty, following which, on December 19, 2002, the then DC, Mr Aggarwal, placed her under suspension. Her appeal against her suspension was dismissed by the Financial Commissioner, following which she approached the High Court. However, her writ was dismissed as withdrawn on February 27, 2003. Thereafter, the petitioner, Mr Shamsher, moved the High Court, alleging that BDPO Chand Ram was not conducting the inquiry properly. He also stated since the Sarpanch’s son was a functionary of the then ruling party in Haryana, the INLD, pressure was being brought on to finish the case. On August 5, 2003, a Division Bench disposed of the writ after the Senior Deputy Advocate General of Haryana made a statement in the court that the apprehensions of the petitioner were “wholly unfounded and all attempts will be made to conclude the inquiry expeditiously, uninfluenced by any interference and strictly on materials brought on record by the petitioner and others”. However, it later transpired that just one day prior to the hearing, August 4, 2003, the Haryana Government had already reinstated the Sarpanch. The petitioner then filed a contempt petition. In his reply to the show cause issued by the High Court, Mr Aggarwal stated that the High Court order had been complied with and the Sarpanch was reinstated after following the due process of law. Arrest stayed: Mr Justice S.K. Mittal on Monday stayed the arrest of Mr Ram Bir, a former INLD MLA from Pataudi constituency in Gurgaon. He had been booked by the Haryana Vigilance Bureau on July 30, under various provisions of the Prevention of Corruption Act. In his petition, the former MLA alleged that the case was politically motivated and sought a stay on his arrest. The Bench has fixed November 7 as the next date of hearing in the matter. Family members of Kanshi Ram raised slogans against Bahujan Samaj Party President Mayawati and subsequently burnt her effigy in Ambala Cantt today. The sloganeering and effigy burning of Ms Mayawati took place on the eve of a rally to be addressed by Ms Mayawati at Gandhi Maidan in Ambala Cantt tomorrow. Despite efforts by the police to stop burning the effigy of Ms Mayawati this afternoon, Shri Kanshi Ram Bachao Sangharsh Committee managed to burn the effigy. The family members of Mr Kanshi Ram demanded that Mr Kanshi Ram should be released from the “grip” of Ms Mayawati. Mr Kanshi Ram’s mother, Ms Bishan Kaur, (96) expressed anguish over the confinement of Mr Kanshi Ram by Ms Mayawati. “I just want that my son should be with me. However, Mayawati is not letting it happen,” she said. Mr Dalbara Singh, younger brother of Mr Kanshi Ram, demanded that Mr Kanshi Ram should be released from the ‘clutches’ of Ms Mayawati. “If he is fit, then why not bring Mr Kanshi Ram outside and if he is unfit, why not admit him in hospital,” he said. “Why stop the immediate family members of Kanshi Ram from meeting him,” he queried. Ms Swaran Kaur, a sister of Mr Kanshi Ram, said that they had met Mr Kanshi Ram about three months back. “When we had gone to meet Mr Kanshi Ram, a nurse was standing there and she prevented us from even touching Mr Kanshi Ram,” she said. She rued whether a nurse was more important than immediate family members. She said they were not attempting to prevent holding of the BSP rally. “We only want that people must know the truth behind Ms Mayawati. We have held protests in different places but now we are holding a protest in Ambala since Mayawati is going to address a rally here tomorrow,” she said. The family members alleged that eversince Mr Kanshi Ram criticised Mayawati on August 28, 2003, at a rally in Lucknow, he had been facing grave consequences. “Mr Kanshi Ram aspired to become Prime Minister but now Ms Mayawati has usurped his position and wants to become Prime Minister,” they said. They said that Mr Kanshi Ram wept whenever he met the family members but still, Ms Mayawati did not allow Mr Kanshi Ram to be looked after by his family members. The accused was produced in the court of Judicial Magistrate (Ist Class), Amrit Kumar, who remanded him to 14 days’ judicial custody. Earlier, he was admitted to the Civil Hospital here yesterday evening as he was seemingly mentally upset, probably after realising that he had himself wiped out his entire family. He was taken to the court from the hospital today morning. He was sent to jail after his judicial remand. Kurukshetra SP Sanjay Kumar told The Tribune that the exact reason which instigated him to wipe out his entire family was not yet known, as he looked mentally disturbed and he did not utter any word since yesterday afternoon. Besides, whatever he said, there was no consistency in his statement, he added. The accused did not even reply to any of the queries of the mediapersons when he was being brought to the courts for producing him before the magistrate here today. At the same time, the SP said that he had killed his family members under a fit of rage, reportedly after a quarrel with his wife. The couple used to fight often over Ram Kishan’s habit of drinking, and it was suspected that he murdered his family members with a spade after she reportedly objected to his habit. Meanwhile, one of Ram Kishan’s brothers Sohan Lal and his neighbours Ram Chander and Multan had claimed while talking to The Tribune yesterday that they had not heard any sound from his house on Saturday night and came to know about the gruesome incident in the morning when the police came to the village. It is learnt that some of the neighbours had heard the noise but they thought that it was usual quarrel between the couple and had not thought that Ram Kishan was killing his family members. Meanwhile, the bodies of Roshni and her four children were cremated at the village crematorium yesterday evening in the presence of hundreds of villagers and their relatives. Interestingly, sources in the department maintain that the team had gone to the village to disconnect illegal water connections. While the officials were at work, Mr Beniwal’s driver, Ranbir Singh, who is a resident of that village, allegedly threatened them with dire consequences and told them to get lost. The junior engineer, heading the team, alleged that Ranbir even assaulted him and other team members. The employees later reported the matter to the Public Health Subdivision, Adampur. According to information, the accused Krishan threw his wife Babli of Gudpur Khalsa village in Indri into Yamuna Canal near Ghoghripur on their way to Narukheri village yesterday night. Her mother Manbhari, who was with them kept on crying for help but Krishan fled from the spot. Later, Babli’s body was found around some distance way. Krishan and Babli were married about four years ago and he reportedly kept on beating her for one reason or the other. At this, Babli lodged a complaint with the police, following which he had to remain in jail for some time. However, Krishan restarted living with Babli at his in-laws’ house in Gudpur Khalsa after a compromise between them after his release from the jail. An FIR under section 302 of the IPC was lodged against him at the Madhuban police station on the complaint of his mother-in-law Manbhari. While addressing a sainik sammelan, General Pattabhiraman exhorted all ranks to prepare themselves to meet the challenges of the future. He paid tributes to 34 personnel of Kharga Corps Engineers who made the supreme sacrifice while laying the Kharo Bridge over the Sutlej. Mrs Laxmi Raman interacted with the women of the Ambala garrison and encouraged them for welfare activities.